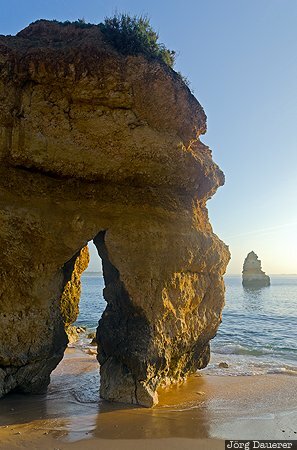 A natural arch at the sand beach Praia do Camilo and a lone sea stack in the background illuminated by warm morning light. Praia do Camilo is near Faro in the Algarve in southern Portugal. This photo was taken in the morning of a cloudy day in March of 2011. This photo was taken with a digital camera.